DOT has a plan for a protected bike lane on 16 blocks of Second Avenue that will test out a new configuration, where the only protection is a row of short, yellow plastic “tuff curbs.” The project shrinks the protected bike lane gap on the avenue in Midtown but still exposes cyclists to fast-moving motor vehicles on the heavily-trafficked approach to the Queens Midtown Tunnel. DOT presented the plan last night to the Manhattan Community Board 6 transportation committee, which endorsed it with one abstention and no votes against. 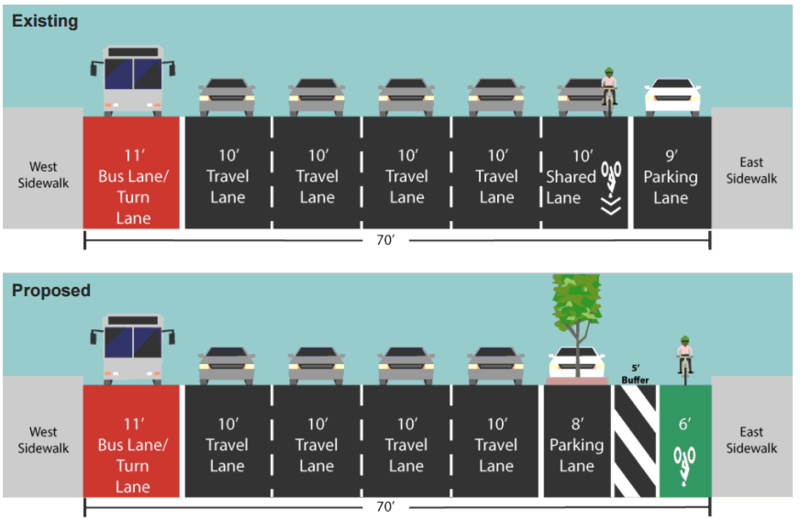 The project calls for a bike lane between 59th Street and 43rd Street [PDF], leaving several blocks approaching the Queens Midtown Tunnel with no changes. Between 59th and 52nd Street, the bike lane would be protected with parked cars. But from 52nd Street to 43rd Street the protection afforded by a parking lane will not be in effect during peak hours. From 7 a.m. to 10 a.m. parking and commercial loading zones will give way to motor vehicle traffic along that nine block stretch. Additionally, between 48th Street and 43rd Street, there will be moving traffic next to the bike lane from 3 p.m. to 7 p.m. To deter motorists from entering the bike lane along those blocks, DOT plans to install “low profile tuff curbs” — yellow plastic bumps. Since 2010, motorists have killed one cyclist and four pedestrians in the project area, including 79-year-old Teresa Martinelli, who was killed at 58th Street just last week. The absence of round-the-clock parking lanes will weaken pedestrian safety measures as well. The parking protected section will have pedestrian islands and dedicated turn signals at some intersections, so pedestrians and turning drivers don’t have simultaneous “go” signals. Below 52nd Street, the rush hour lane traffic lanes preclude those measures. Instead, the plan calls for painted curb extensions on side streets to induce motorists to make tighter, safer turns (see above). The transportation committee endorsed the plan with a request that the city continue to study a continuous protected bike lane for Second Avenue. Still, committee members did not hold back criticism of DOT’s unwillingness to address the remaining gaps. DOT’s Patrick Kennedy and Ted Wright gave no commitment to filling in the remaining gaps, saying the agency has been “talking a little bit about it.” The agency clearly considers the intense traffic on this part of Second Avenue a limiting factor as it phases in a redesign. Did they say why they went with the low profile Tuff Curb without any vertical posts, as opposed to the regular, taller Tuff Curb (with or without the posts)? The former might be more forgiving for someone on a bike (like the roll-up curbs used in The Netherlands) but I suspect people will be tempted to pull over this and park in the bike lane. Also, I’m very concerned about the mixing zones for turning, or lack thereof. In this design, as opposed to the 1st Ave design, there is no turning pocket out of the general travel lanes and no obvious geometric constraint to slow down turning drivers. In the image below, what’s to stop people driving from making left turns across the invisible bike lane directly from the left travel lane without slowing down? How about some traffic spikes? Motorists usually respect those. Toronto has something fairly similar, it is definitely a problem if the car or delivery truck really wants to pull over. Will depend on enforcement. At least CB6 was able to meet to approve this. Uptown Community Boards take the summer off, leaving the neighborhoods awash in trash and noise and putting things like DoT projects on pause. I’m willing to keep an open-mind on this design. Motorists LOVE illegally stopping in rush-hour-only lanes (see Flatbush Ave, for example), and I’m optimistic that they’ll do the same here instead of illegally stopping in the bike lane. Did DOT indicate when the new infrastructure will be built out? I’m more pessimistic. Flatbush does not have bike lanes for them to stop in. Motorists love to illegally stand or park in no stopping zone curb-side bike lanes (Adams/Boerum @ Fulton; Centre near Worth, etc.) The “tuff” curbs will discourage some of that, but how much remains a question (and we cannot count on strict enforcement). The proposed signage is itself confusing. On one side, it has this relatively small box indicating “bike lane,” with the rush hour lane designation taking the substantial majority of the space. At a quick glance, I really thought the sign was indicating that the bike lane itself was off-hours only – meaning that it could be used by drivers during rush hours. The low curbs will only feed that misperception. I’m very skeptical that it’ll work here, to say nothing of the way the lane ends before hitting the midtown tunnel. But I guess when your DOT conceptualizes traffic as “toothpaste,” you have to take what you can get. Seems more likely to keep cyclists in rather than keep cars out. I’m all for cyclists staying in their designated lanes, but there are obviously times where you are forced out and I could see a “tuff curb” being a problem. These will be gone after the first snowplowing. See: 34th street bumps, all shaved off by now. Seem particularly dangerous blocking exit of the lane by a cyclist is trying to avoid the inevitable blockage of the bikelane, but truck, car, hole, improperly installed metal plate, pedestrian, boxes, glass, tree branch, jogger, 4 abreast slow moving biker group, just to mention a few of the obstacles I exited the bike lane to get around on my commute to work today. Speaking of 2nd Ave, does anyone know when we should start seeing a southern expansion of the PBL from East Harlem into the UES? Any estimate on when the city is going to start repairing the street? It looks OK to roll over (just don’t try to go over at too oblique an angle), but I’d rather have something I might have to (rarely) lift my bike over that would be significantly more likely to keep people from parking or even driving in the lane. This is why the green paint needs to continue through the intersection. A better design would be shifting the bike lane to the right (requiring turning motorists to yield as they cross the bike lane). At least the committee is concerned about safety here; I hope they stay on the DOT to improve this. Possibly not until 2017 because it’s going into the pipeline late in the season.